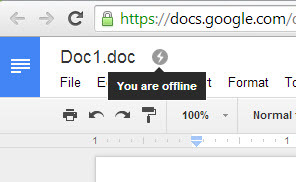 How Do I View and Edit Google Drive Documents Offline? When you travel, working on documents stored on Google Drive may not be possible since you might not always have access to an Internet connection. Fortunately, Google Drive can be configured to run even without the Internet so that you can view and edit your documents no matter where you are. Here is how you can turn this feature on. 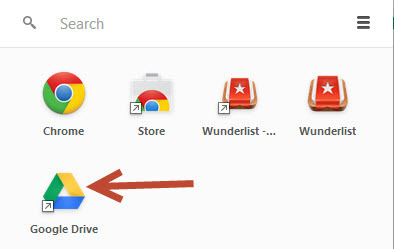 Before you can view and make modifications to your Drive documents offline, you have to connect your computer to the Internet to install additional software. Warning: In order to use the offline editing feature, you have to use the Google Chrome browser. 1. 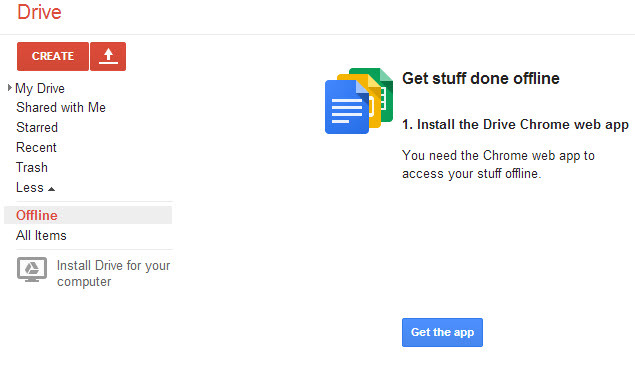 Launch Chrome, and sign in to Google Drive using your account. 2. Once you are logged in, click More on the left side of the page to see the full list of options. Click Offline to continue. 3. 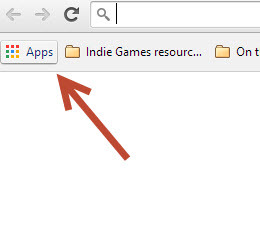 Next, download and install the Drive web app to the browser by clicking the Get the app button. When you see the confirmation box, click Add to start the installation. 4. 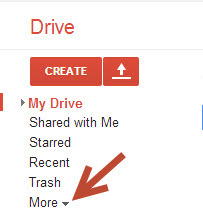 After the installation process is finished, you can access the new Drive app by opening a new Chrome tab and clicking the Apps button on the bookmark bar. 5. 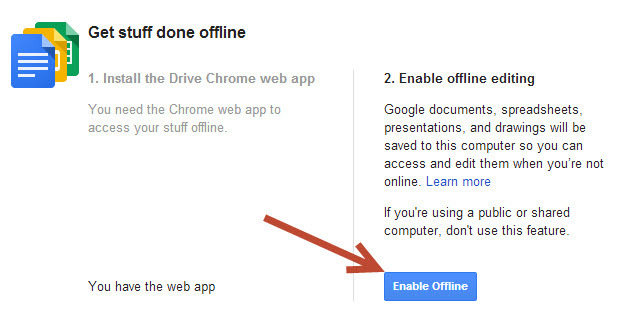 Now that you have the app installed on the system, let us switch to the Google Drive website and click the Enable Offline option. If this option is grayed out, refresh the page so that it recognizes the newly installed app. Once the Enable Offline option is set, you will be redirected to the landing page, and your documents will be synced to the computer for offline editing. Please do not close the browser tab while the app is syncing data. The line at the top of the browser will help you track the process. Whenever you create new documents, the system will sync the new files to your computer as well. 6. 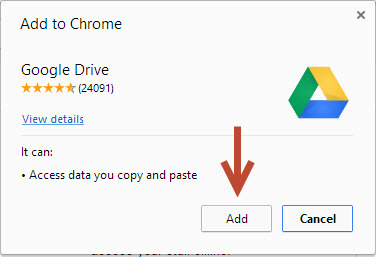 When you want to view or edit the files offline, just launch Chrome, go to Apps -> Google Drive, and select the desired document. In the app list, you may notice that the icons of some apps are grayed out while others are not. This is because those grayed out apps require an Internet connection and cannot work in offline mode. 7. As you edit a document, you may notice the little thunderbolt icon next to the document name indicating that you are in offline mode. Every change you make to the document will be synced back to the cloud when the Internet connection is available.